More NYFW love. There are some incredible design statements walking the runway. I am loving so many of them, including Jason Wu, J. Crew, rag and bone, Oscar de la Renta, DVF, Parabal Gurung and Christian Siriano. 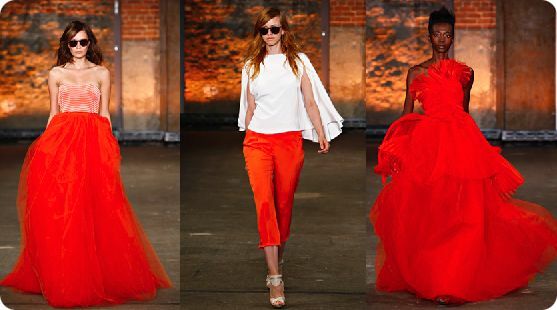 Christian's show was so catching - I love the mix of soft femininity and bold colors as well as his color pairings. I was so inspired by his line, I had to turn it into a room that any small space dweller would love. I really love his poppy red designs (that dress is stunning! )and thought this modern living room was a great complement. You can certainly add bold color to a small space. The trick is to edit your additions. The artwork, pillows and coffee table books create a cohesive design message in the room while adding depth. 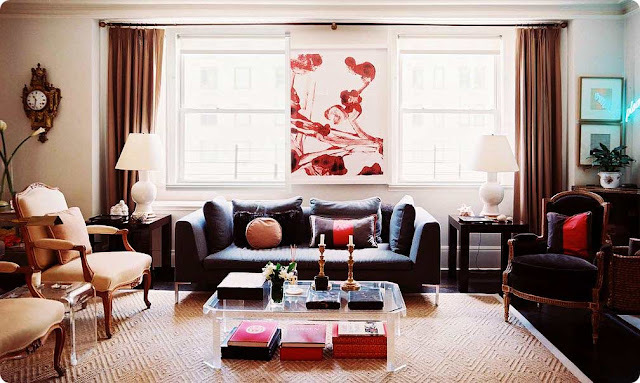 Another small space tip is to include pieces that appear to float, like the acrylic coffee table. Your eyes will keep moving and open up the space. My next fave is the pale gray, cream and chartreuse collection - my oh my. So elegant yet modern with a touch of edge. (Katherine Hepburn was his inspiration for the line) The design of this open space living room and kitchen evokes a similar vibe. I love the idea of two tones of the same color in a small space. It adds a design element and dimension, which all small spaces benefit from. A few affordable additions of color through flowers makes this room flow and perfect in harmony. 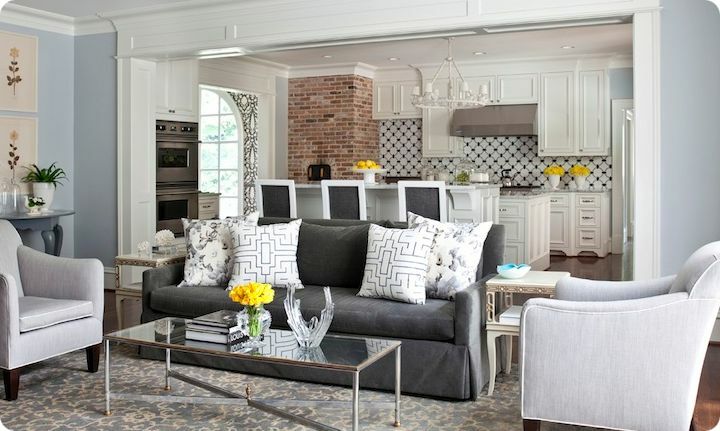 Small space tip - if you have an open space like this room, forget placing your pieces against a wall. Float them and create a zone. Are you loving the collections? Share your favorite designs. Who is the designer for the 2nd set of fashion pics? I really love it! I also noticed your series and inspiration which kind of relates to what I have too. PS: I stumbled on your site from researching on small space storage.